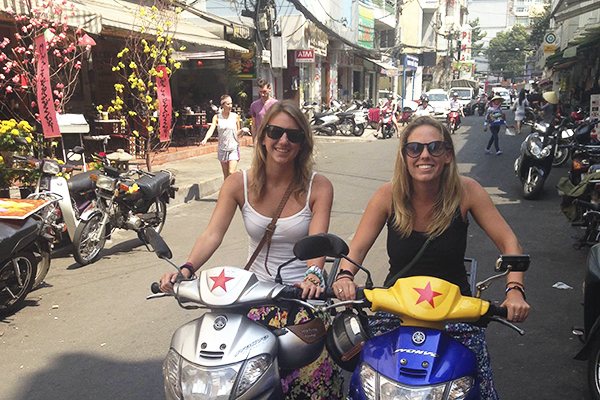 After leaving a career in advertising, alumna Julie Kern started a travel magazine with her best friend that features vacation ideas for both low and high budgets. Scuba diving with sharks and manta rays in Indonesia may sound like a once-in-a-lifetime vacation, but for 2010 business school alumna Julie Kern, it’s just a part of the job. Kern and her best friend Jess Vitorelo turned their passion for travel into a business when they launched their online travel magazine, Wanderlove, in July. Kern, who studied abroad in Rome during her time at GW, was first inspired to start a magazine after working at a large advertising agency in New York from 2010 to 2013. Feeling burned out from the fast-paced environment, Kern decided to leave city life and invited Vitorelo, who studied event management at California State University, Chico, to go on a five-month trip through Southeast Asia. When they returned from their trip, which included a cross-country motorbike tour through Vietnam with two guys they met on a bus, many of their friends began asking for advice in planning their own adventures. Kern and Vitorelo then decided to start a website where they could reach a larger audience with their personalized advice. Kern said the website caters to two different types of audiences: budget travelers, or “anyone that will stay in a $3-a-night hostel,” and vacationers who may be looking for nicer accommodations. Kern and Vitorelo write all of the reviews and guides themselves but also include an “Inspiration” section on the site where they have trusted friends contribute their travel wisdom. Throughout all of their adventures, Kern and Vitorelo are committed to staying on a budget. “We’d never want to go and review the Ritz Carlton. That’s not us,” Kern said, adding that recently they stayed in a hostel with no sink. This summer Kern and Vitorelo went on their first Wanderlove trip: two months in Bali, Indonesia, which they funded in part through exchange-based partnerships. The partnerships allow Kern and Vitorelo to have free experiences at hotels, yoga retreats, surf camps and scuba companies in exchange for a review on the site. Traveling for business has only enhanced their experiences, Vitorelo said. “It’s actually really exciting because now when we go to a place we’re like, ‘OK, how can we photograph this so that we can explain it to someone else really quickly?’” Vitorelo said. The site averages about 4,000 monthly page views, Kern said. Their Wanderlove Instagram account, full of stunning images of crisp, blue oceans and lush, green forests, has more than 3,000 followers. When not traveling, Kern and Vitorelo do freelance part-time advertising and marketing work at their homes in San Francisco. Vitorelo said eventually they hope to generate advertising revenue through banner ads on the site once they build up its traffic. Eventually, Kern and Vitorelo want to have their own Wanderlove offices. They also want to hire ambassadors who could go on trips for them through exchange programs.